Williams, McClure & Parmelee provides a broad range of legal services with concentration in the areas of insurance defense litigation and business representation. 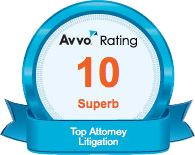 Our attorneys have over 90 years of combined legal experience. The firm has extensive experience in business and insurance company representation including insurance defense, construction law, transportation law, workers’ compensation defense and employment law defense. Our firm places special emphasis on representation of insurance companies, third party administrators (TPA’s) and assisting insurance claims management and claims personnel. 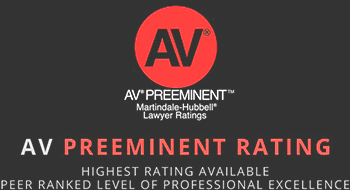 Williams, McClure & Parmelee combines large firm performance with small firm relationships and small firm fees. 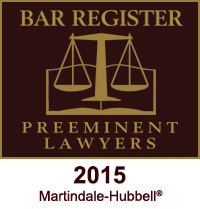 Williams, McClure & Parmelee is a preferred law firm for the Insurance Management Institute Insurance Law List. 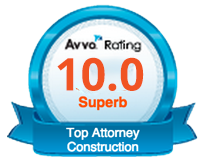 The firm is recommended counsel of the Directory of American Business & Insurance Attorneys (ABIA). The firm includes an Associate Member of the Risk and Insurance Management Society, Inc. (RIMS) as well as a member of the Transportation Lawyers Association (TLA). 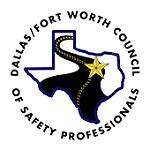 We are also a listed Insurance Defense Law Firm by Casualty Adjusters Guide (CAG). Attorneys at Williams, McClure & Parmelee have litigated cases before state administrative agencies, state courts, federal agencies, federal courts and the American Arbitration Association. The firm’s membership has been awarded the AV® Preeminent™ Rating by Martindale-Hubbell®, the country’s leading legal directory (5.0 out of 5.0). 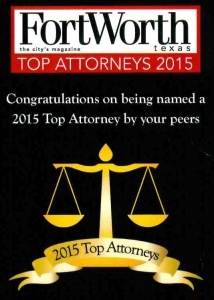 This designation is a widely respected mark of achievement; it differentiates an attorney from his or her competition. 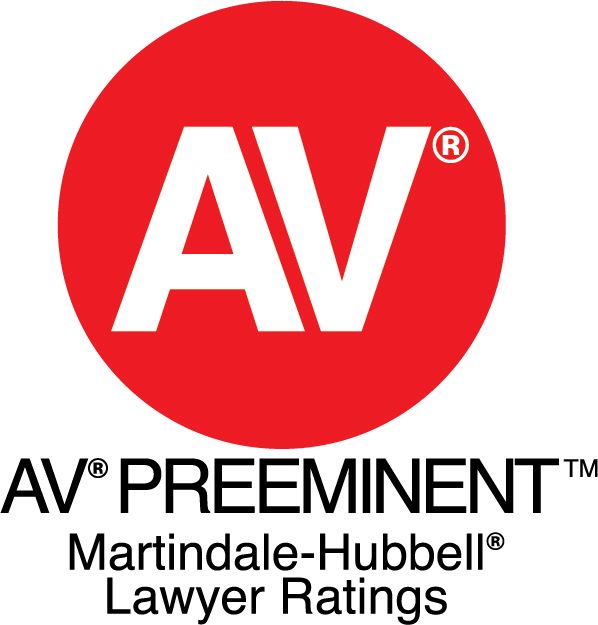 The Martindale-Hubbell® Peer Review Ratings™ are an objective indicator of an attorney’s high ethical standards and professional ability, generated from evaluations of attorneys by other members of the bar and the judiciary. 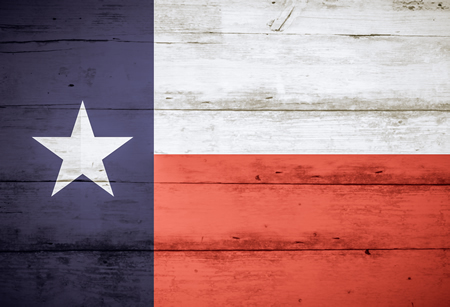 The firm also includes an attorney Board Certified in Workers’ Compensation Law by the Texas Board of Legal Specialization. 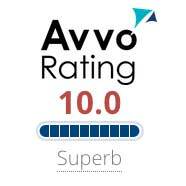 The firm includes an attorney awarded a Top Attorney “Superb Rating” by AVVO (10.0 out of 10.0), a rating calculated using a mathematical model that evaluates relevant data in a legal profile, including experience, disciplinary history, professional achievements, client reviews, peer reviews and industry recognition .The rating system periodically collects background data from multiple sources, including state bar associations, court records, lawyer websites, and other information, and is considered a premier consumer dedicated attorney rating system. 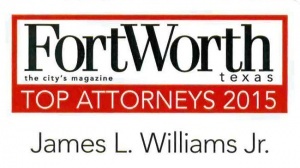 The firm has also been picked by Expertise.com as among the top 17 litigation attorneys serving Fort Worth, Texas in 2018. 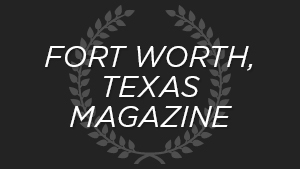 Expertise.com scored litigation attorneys on more than 25 variables across five categories, including reputation, credibility, experience, availability and professionalism and analyzed the results to give a hand-picked list of the best litigation attorneys in Fort Worth, Texas. 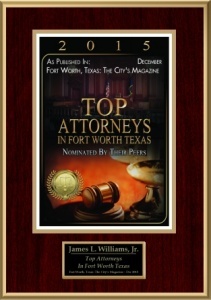 Mr. Williams was awarded the Top Attorney Rating by Fort Worth, Texas Magazine in 2002, 2014, 2015, 2016 and 2017. 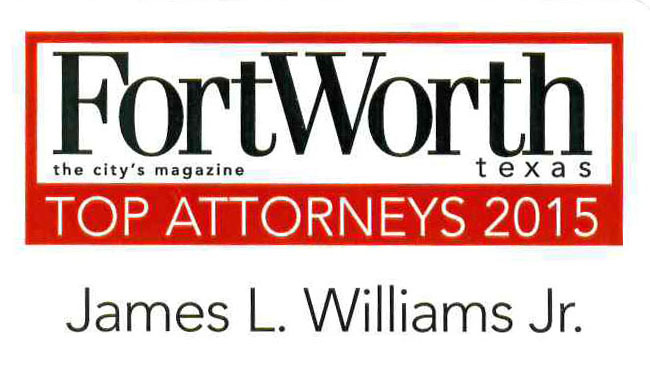 Additionally, American Registry LLC, has named James L. Williams to The Registry™ of Business and Professional Excellence. Williams, McClure & Parmelee has also been recognized for excellence in adherence to the highest professional standards and integrity by Claims and Litigation Management Alliance (CLM).